After the Saltillo tiles have been installed properly, and the tiles are thoroughly clean, free of efflorescence and dry, follow these steps for a traditional medium to high gloss look with excellent stain resistance. To ensure that end results and appearance are satisfactory, it is recommended that the sealer be tested in a small area prior to total application. Grout according to grout manufacturer directions. Clean as you grout to minimize water contact on tile. Be sure tile is clean and dry before sealing- Wait at least 24 hours, or more. Apply two (2), or more coats of Glaze`N Seal Ole® Sealer to tile and grout. Use thin, even coats. Minimize foaming. If streaking occurs with first coat of Ole®, dilute slightly with water. Allow sealer to dry approximately (1-3) hours between coats. Tile is fully sealed when last coat does not darken tile. Apply additional coat in areas where staining is a concern. After final coat has been applied, allow sealer to dry overnight. Limit traffic on newly sealed surface. Allow 72 hours cure time before exposed to moisture, contaminants and vehicular traffic, as the sealer will continue to cure and harden for 10-14 days. To test stain resistance, sprinkle water or cooking oil drops on an inconspicuous area. If tile darkens, additional sealer is needed. INDOORS ONLY – Apply two (2) or more coats of Glaze ‘N Seal Floor Polish 48 hours after sealing. Allow 60 minutes between coats. Use “glossy finish” or “matte finish” polish, depending upon desired look. Reapply polish as needed to extend the life of the sealer. Maintain you floor with daily sweeping or vacuuming of dirt and loose soil. Regularly damp-mop floor with water and Glaze `N Seal Neutral Cleaner. Use a minimum amount of water on floor and dry promptly. Promptly wipe up any spills to minimize staining risk. As necessary, re-apply floor polish to prevent “wear-thru” of polish. 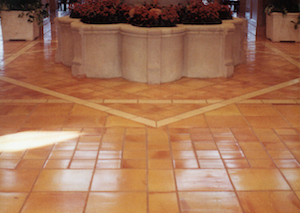 If polish is properly maintained, the Saltillo tile should not require re-sealing. 8. For more intensive heavy duty cleaning or removal of topical wax and polish use Glaze ‘N Seal Heavy Duty Cleaner. A darker, “wet look” appearance may be achieved by using Glaze `N Seal “Wet Look” Lacquer, a solvent-based acrylic, instead of the Ole®; Sealer. Read package directions carefully. 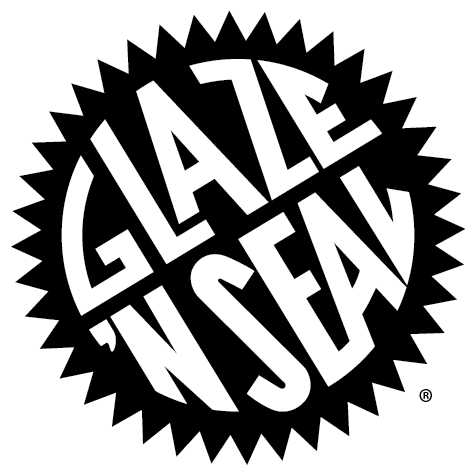 A no-shine, “natural look” appearance may be achieved by using Glaze `N Seal Natural Look Penetrating Sealer. (NOTE: *This is economical water repellant and is recommended when oil and grease staining is not a major concern. If a natural look with oil resistance is needed, use Stone Sealant Impregnator). A “natural look” appearance, plus exceptional stain-resistance, may be achieved by using either Glaze `N Seal Stone Sealant Impregnator (water base) or Stain Defense Sealer (solvent base). These unique, state of the art premium penetrating formulas, penetrate below the surface to block contaminants from getting into the tile. These products work without changing the appearance of the tile. CAUTION! SAN GENIS Tile is a popular machine made tile often mistakenly referred to a Saltillo because of its similar appearance. These machine extruded tiles although porous are not the same. Glaze ‘N Seal “Wet Look” Lacquer is NOT recommended on these tiles. Glaze ‘N Seal OLE® Sealer may be used but it is recommended the first coat of sealer be diluted with water to improve the bonding (one part water one part sealer). This entry was posted in How to Seal and Care. Bookmark the permalink.